The Lehighton gage set an all-time low water level reading for the date today - at 516cfs - about 20% of normal. 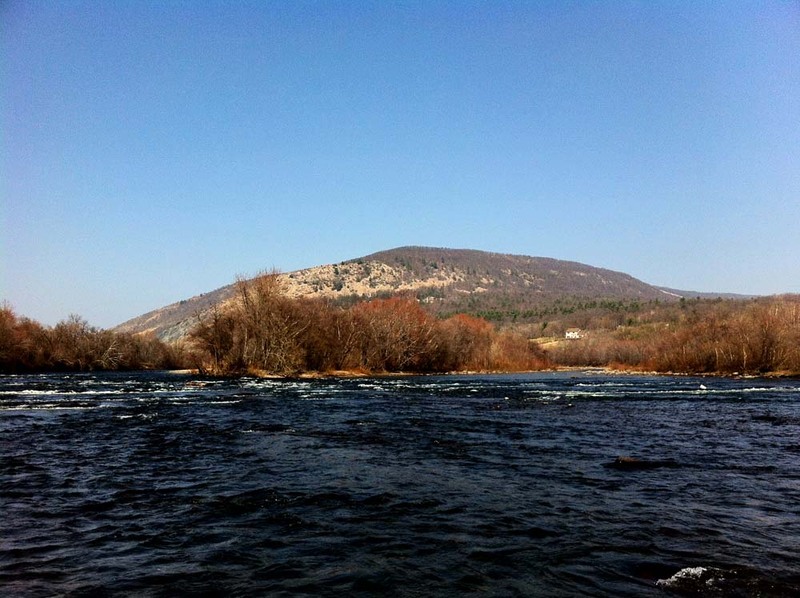 For those that want to get a taste of big water trout fishing, without all the hard wading that usually comes with it, now is the time to scout the Lehigh. Don't blink, or this season might just pass your by! What makes us say that? Well, it was the sight of some hendy spinners on the Lehigh today! 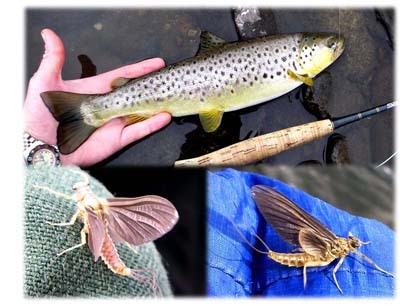 Along with the spinners there were adult hendys, quill gordons, caddis, olives as well as little black stones. Quite the smorgasbord!! That means the march browns and the grey box can't be too much furthur behind! With such a bug soup, and the water at so low a level for this time of year, you better believe the fish are looking up! 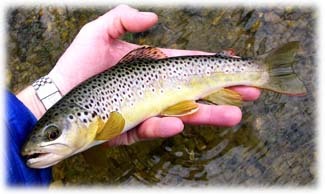 It is hard to imagine but our first trout of the year on the Lehigh came on a dry, and not the usual bugger or wet! That right there just shows how unreal of an early-season dry fly fishing situation we are currently experiencing on the Lehigh. If it is a trout, there is a good chance it is looking up. And they ain't too picky at the moment. 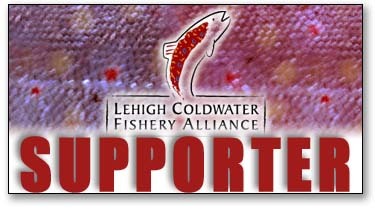 Even more astonishing with the current fishing situation is the lack of anglers out on the water. Maybe we should not be complaining, but to see such a great resource not being utilized is shocking. Who knows maybe the weather personalities scared everyone away today with all the rain, and doom and gloom talk. 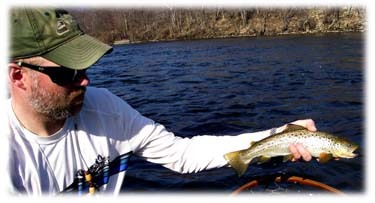 Anyway, it turned out to be a pretty decent weekend, and during a three-hour stint, not one other fisherman was seen. Lets hope the good fishing continues. So far this season is off to a hot start! Blizzard! Starting at about 2pm - the little black stones began to make a presence. And then not too much after that - it was a full-on blizzard hatch of stones. Fortunately the fish were on them with targets a plenty. We had heads and it is only mid-to-late-March! No doubt this is a direct result of the low flows we are currently seeing (and here), the gin-clear water and mid-April - four-weeks ahead of schedule situation going on. However, all that said, it is great to see so many fish up and feeding at this stage of the season. That means they weathered last summer and fall without too much stress. Although we only a landed a few on top - we had three times that many on! All on the dry! And some were pigs! One in fact broke the shank on a size 12 - 3x long little black stone dry. It's safe to say the fish have been eating well! Besides the stones we also saw about a dozen mayflies - olives! I'm glad we didn't see any of the other April Greys. But expect them any day! What a great day on the water! 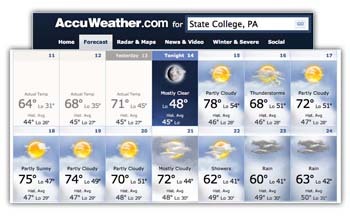 March 15, 2012 - May-like Warmth In March! You might want to make sure you've got your sulphur collection dialed in - because the way things are going, they could be here before you know it. I don't know about you, but this weather sux! Just too much warmth, too early and not enough rain. The hatch scene here in SE PA is prolly a good two+ weeks ahead of schedule. And with the long range showing very little break, things could bust open with who knows what coming off all at once! Chances are very good that we are going to be looking at unfortunately a compressed hatch season. So if you are one to chase the hatches, you should definitely be looking at bumping your trip dates up a bit. Sure things could change, but the way things are looking right now, I would not count on it. Let's hope that I am wrong. 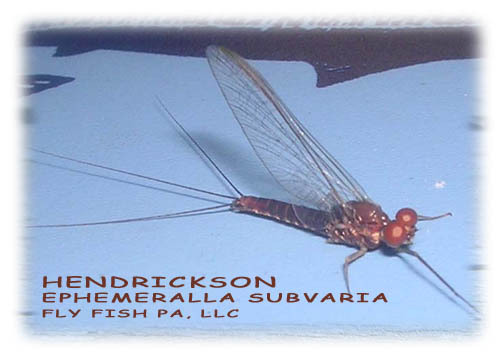 Due to the fact air and water temps have been so much warmer than usual this winter, we are seeing the first of our early-season mayfly hatching in great numbers at a very early point in the season. Usually we begin seeing the early-season olive in late-March and into April. And then soon there after we begin to start to see the apple caddis - - which always get the trout slashing about recklessly. 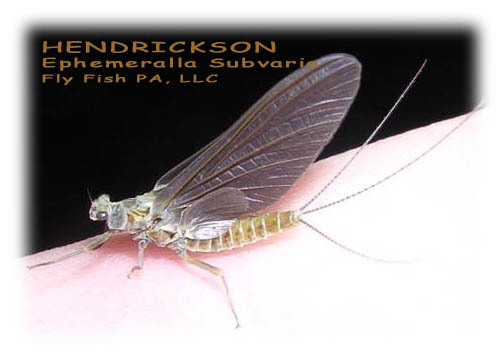 With the way things are going this year, we could be looking at the caddis in late-April. Hopefully this is not a pre-cursor to the way things will play out this season. All that said, for the angler out on the water during this early-season olive hatch it is always worth a shot to fish a dropper as well as a dry simultaneously. For a dropper you can’t go wrong with hanging a nitro off a dry. 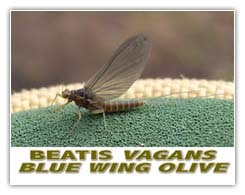 The nitro does a great job at imitating both an olive emerger as well as a caddis pupa. March 6, 2012 - Who Brought the Gin...? ...’Cause the olives were a plenty! However, despite the numerous bugs on the water and in the, it appears the fish are getting a bit more weary of what's going on around them. This is very early in the year for this to happen, but obviously with so much nice weather this winter, it's as if the fish never did get a break. Air temps have been comfortable for the angler just about all winter long, and there has really not been too much in the way of back-to-back big rains to off-color the water for a considerable amount of time. As a result of the hypersensitive weary-ness, we had to drop down in tippet size - 6x, and even drop down a bit in fly size - 16-18s. As has been the case as of late, a simple parachute pattern does a great job of riding flush in the film, and just looks too good to resist. 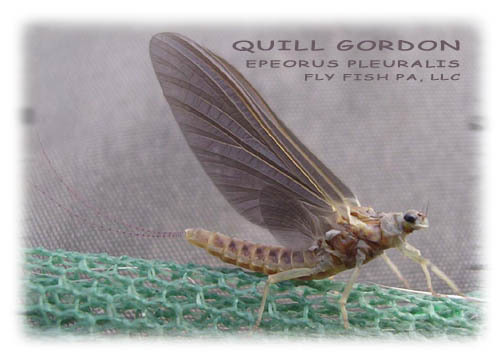 By using a white poly as a post, the fly can stick out on the water, even in smaller sizes.